Bigger screen, better S Pen, and bolder colors. The Samsung Galaxy Note 9 may not come as a great surprise, after the usual cavalcade of pre-announcement leaks, but today’s big Unpacked news is rich pickings for stylus fans nonetheless. The big question was just how much would Samsung differentiate the Note 9, not only from its predecessor, but from the Galaxy S9+ launched earlier this year. The answer, it turns out, is “it’s complicated.” This is no grand reinvention, and Note 8 owners may not find themselves picking their jaws off the floor at what the Note 9 brings to the table. What is on offer, though, is a thoughtful blend of what’s been Samsung’s 2018 strategy so far, along with a renewed focus on what has always made the Note series such a hit. First things first: get ready for some color in your life. Samsung has been criticized in the past for holding back the US launch of its brightest finishes, and it’s going in the complete opposite direction with the Galaxy Note 9. When it hits US store shelves on August 24, it’ll be offered either Ocean Blue – with a fetchingly contrasting yellow S Pen – or Lavender Purple. No black or silver to be found. Internationally, there’ll be Metallic Copper and Midnight Black variants, too. In many ways, the similarities are greater than the differences when you put the Note 9 side by side with last year’s Note 8. The display is slightly larger on the newer phone – 6.4-inches, rather than 6.3-inches – though the Super AMOLED panel runs at the same 2960 x 1440 Quad HD+ resolution. There’s still IP68 water and dust resistance, whether or not the S Pen is in its silo, and the stylus itself is IP68 compliant too. The Galaxy Note series has always been centered around Samsung’s S Pen digital stylus, and the Note 9 is no different. Until now, every interaction between the pen and the phone has been at close quarters, but this new generation of S Pen adds in Bluetooth LE. It means the S Pen can control the Note 9 from up to 30 feet away. It’s powered by a supercapacitor, which recharges whenever the stylus is docked into the phone. 40 seconds inside gives around 30 minutes of use, or up to 200 clicks of the S Pen’s side button. Even if the supercapacitor runs out of juice, though the Bluetooth won’t work you’ll still be able to use the stylus on the display like usual. As before, you can jot down notes on the smartphone’s lock screen, make sketches, sign documents, annotate presentations, and generally navigate the Note 9 with the pen. New with this Bluetooth version, however, is the ability to press and hold the side button and launch an app. It’s user-customizable, though will be preset to the camera. Double-clicking the button after the camera app is open flips between the front and rear cameras; clicking it once takes a shot. If you’re listening to music, meanwhile, you can use the S Pen to navigate through your playlist, with support for play/pause and skipping forward and backward through the tracks. Alternatively, you can use it as a clicker to navigate forward and back through a presentation. In short, it’s the ability to control the Note 9’s core features from afar. If you’re on the treadmill and want to control your music without fumbling for your phone, the S Pen could be a handy shortcut. Similarly, if you end up absent from group photos, the S Pen is a lot more flexible than a standard timer. It’s likely to come into its own, though, when third party apps start to use it. Samsung has an SDK for developers to integrate S Pen Bluetooth functionality into their apps, though the company says it has nothing to share right now on which third-parties might be using it. That’ll apparently come later this year. Inside, there’s Qualcomm’s Snapdragon 845 – for the US market, at least – with some custom Samsung tweaks to the GPU to improve performance, and a “water carbon cooling system” with a thermal spreader three times the size of the Note 8’s. There’s a Cat.18 LTE Advanced modem, too, with support for up to 1.2 Gbps downloads, carrier depending, thanks to its 4×4 MIMO/CA and LAA. WiFi 802.11ac (2.4/5 GHz), Bluetooth 5.0, ANT+, NFC, and the usual positioning sensors are all included, together with a USB-C port. Samsung will have two storage variants of the Note 9, also differentiated by RAM. The 128 GB Note 9 will come with 6 GB of LPDDR4 memory, while a 512 GB Note 9 will bump that up to 8 GB. Each will have a microSD slot, supporting up to 512 GB cards. You still get a 3.5mm headphone jack, and stereo speakers that have been tuned by AKG. Whichever storage/memory combo you pick, the Note 9 packs a 4,000 mAh battery, a considerable step up from the 3,300 mAh of its predecessor. There’s fast wireless charging, too, and Samsung has a new Fast Wireless Duo Charger that has two Qi-compliant pads, which will be sold as an accessory. The theory is that you’d charge your Note 9 on the upright side, and a smartwatch on the flat side, though since it’s standard Qi you could charge any combination of compatible devices. What changes there’ve been, then, are small but fairly meaningful. The fingerprint sensor has, following the well-received example of the Galaxy S9, been moved from alongside the rear camera to underneath it. That makes it much easier to find with your fingertip, without inadvertently smudging the camera lens in the process. You get Knox security and Samsung’s other biometrics – facial recognition and iris scanning – too. The camera, too, follows the trajectory of the Note 8 and the Galaxy S9. It’s a dual lens, with dual optical image stabilization: one of the 12-megapixel sensors has a 2x optical zoom, while the other has Samsung’s trick Dual Pixel technology. That allows the sensor to flick between f/1.5 and f/2.4, depending on lighting conditions. As before, you can leave the camera to pick the aperture it thinks is best, or you can swipe into Pro mode and switch it manually. The hardware is the same as before, in fact, but Samsung is putting a lot of emphasis on its updated auto mode. Most smartphone users, the company suggests, aren’t looking to dig into the minutia of the camera app’s settings. Instead, it argues, they just want the phone to deliver the best shots possible. Scene Optimizer is a new feature added to the auto mode, which uses AI to identify different scenes and change the camera settings accordingly. It’ll differentiate between 20 different types of scene – including things like mountains, food, text, flowers, pets, and more – and tune the brightness, contrast, white balance, and color. So, if you’re taking pictures of flowers, the Note 9 might boost the colors to give petals more saturation. If you prefer, of course, you can just turn Scene Optimizer off. The other change to the camera app is Flaw Detection. If you’ve ever swiped through photos you took earlier, only to realize that shots you thought would be great are, in fact, blurred or full of people blinking, the Note 9 aims to assist. Each shot is analyzed, and the phone can flag problems – blurred images, smudges on the lens, people blinking, or a backlit subject – and suggest you retake the shot before the moment is gone. Samsung DeX enters its third generation with the Galaxy Note 9, and it’s getting even easier to hook up an external display and turn the smartphone into a PC replacement. Unlike the docking stations of before, the Note 9 can switch into DeX mode with a USB-C to HDMI adapter. Samsung will sell you one, but any spec-compliant dongle should work. Plug it in, and you get a dual-screen desktop. The Note 9’s display – and all its apps running on Android 8.1 Oreo – can be interacted with independently of what’s on the HDMI display. You can use a Bluetooth keyboard and mouse, or turn the smartphone into a virtual trackpad via an option in the notification tray. The on-screen keyboard automatically pops up on the phone if you encounter a text field. Like the rumors suggested, the Note 9 won’t be a cheap phone. The 128 GB version will be priced at $999.99, and available unlocked direct from Samsung, as well as through AT&T, Verizon, T-Mobile, Sprint, U.S. Cellular, and Xfinity. It’ll also be sold at Amazon, Best Buy, Costco, Sam’s Club, Target, Walmart, and other stores. The 512 GB Note 9, meanwhile, will be $1,249.99. It’ll be offered through AT&T, T-Mobile, Verizon, U.S. Cellular, and from Samsung direct, as well as other select retailers. As for when you can get it, preorders will open tomorrow, on August 10. In-store availability will follow come August 24. The Samsung Fast Wireless Duo Charger, meanwhile, will also go up for preorder on August 10. Those who preorder will get to choose either a pair of AKG noise-cancelling headphones (usually $299) or a Fortnite Galaxy Skin with 15,000 V-bucks ($150 value overall), or both for $99 more. For 2018, Samsung has focused its attentions on the fundamentals of the Note experience, and the Note 9 is all the better for it. What’s notable is that, even with the improvements, there’s no huge gulf between what we saw last year, and what Samsung is offering today. Then again, we weren’t necessarily looking for a complete reinvention for its own sake. What Samsung has done is introduce clear space between the Note 9 and the Galaxy S9+, something which could not be said for that phone and last year’s Note 8. Greater S Pen functionality, the option of more memory and significantly more storage, and a smarter camera that promises to make photography more efficient all tap into the core message that says the Note is about getting things done. That productivity comes with a hefty price tag, though if recent smartphone flagships have shown us anything, it’s that there’s certainly a not-insignificant cohort of people willing to pay top dollar for the highest-end device. If you’ve been holding on to your Galaxy Note 5, the Note 9’s appeal is even stronger. 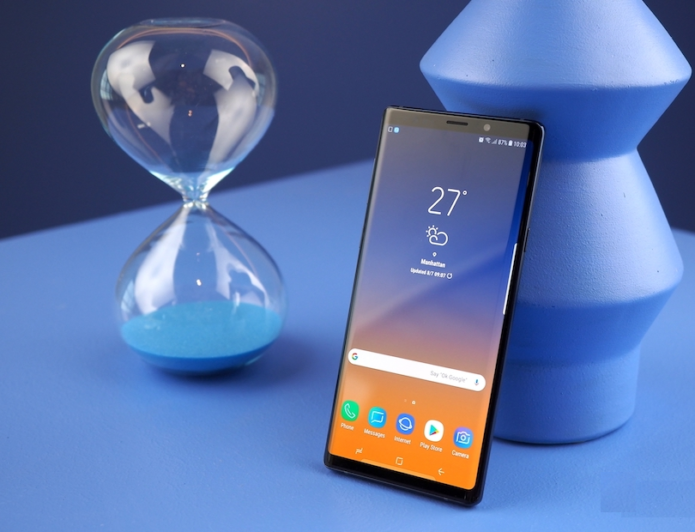 Those considering replacing their Note 8, though, might find the Note 9’s improvements just don’t put enough distance between the phone that’s currently in their pocket.